This call includes different studies ranging from seized cocaine samples and 'pasta base' (a cocaine derivative) essays to studies on the impact of consumption of these substances on health. Salvarezza and Molina during the signature. Photo: CONICET Photography. 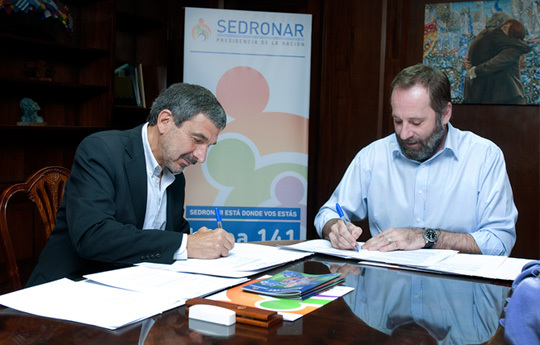 The president of the National Scientific and Technical Research Council (CONICET), Dr. Roberto Salvarezza, and the secretary of the Programación para la Prevención de la Drogadicción y la Lucha contra el Narcotráfico –SEDRONAR- [Secretariat of Planning for the Prevention of Drug Addiction and Action against Drug Trafficking], Juan Carlos Molina, signed an agreement to establish a regulatory framework, identify, administer and jointly finance Proyectos de Investigación Orientados -PIO-[Oriented Research Projects]. The event was attended by Dr. Dora Barrancos, director of the Area of Social and Sciences and Humanities of the CONICET. During the signature, Dr. Salvarezza commented that “the subject matters of these projects are really interesting because for more than ten years the State has demonstrated that it is strongly committed to scientific research and our duty is to use that generated knowledge to enhance public policies”. For his part, Molina stated that “this agreement is very significant because it will provide scientific strength and the promotion of studies that were unable to be made before because we did not have the necessary laboratory infrastructure and tools”. Dr. Barrancos emphasized her institutional and civic commitment to support these initiatives. “We need to work on the figures on drug addiction and to further the fight against drug trafficking”, she commented. The research areas to implement the projects include: seized synthetic drugs and samples and ‘pasta base’ (a cocaine derivative) essays; the development of reagents to identify substances or controlled substances families by colorimetric methods; bubble formation or presence of turbidity and precipitates; pH measurement and any other essay whose positive result can be observed with the naked eye; studies on the impact of consumption of these substances on health; and epidemiological and social aspects of the consumption of drug design and Nuevas Sustancias Psicoactivas -NSP-[New Psychoactive Substances]. With this agreement, the parties established that the Projects are going to last two years and they will not accept more than four projects by grouping topics. Regarding the implementation of the selected projects, a total of $ 2,000,000 will be financed in two years. The event was attended by: Patricia Maccagno, director of Agreements and Projects of the administration of Scientific and Technological development of the CONICET, and from SEDRONAR, Aiscar, secretary of Diseño, Monitoreo y Evaluación de Abordaje Territorial, Relaciones Internacionales y Control de Precursores Químicos; Ricardo Dios, national director of Registro, Análisis Técnico y Control del Uso de Precursores Químicos; Guadalupe García, director of the Observatorio Argentino de Drogas; and Gabriela Sosa, director of Evaluación Técnica y Control de Precursores Químicos.